The world is holding its breath as Saudi Arabia and Iran -- the kingpins of OPEC -- engage in a scary staring match. In recent days, tensions have dramatically increased between the two countries. Together, Iran and Saudi Arabia hold one-quarter of the planet's proven oil reserves and until a few years ago such a conflict would have sent oil prices skyrocketing. But this time, oil prices haven't gone nuts in response. 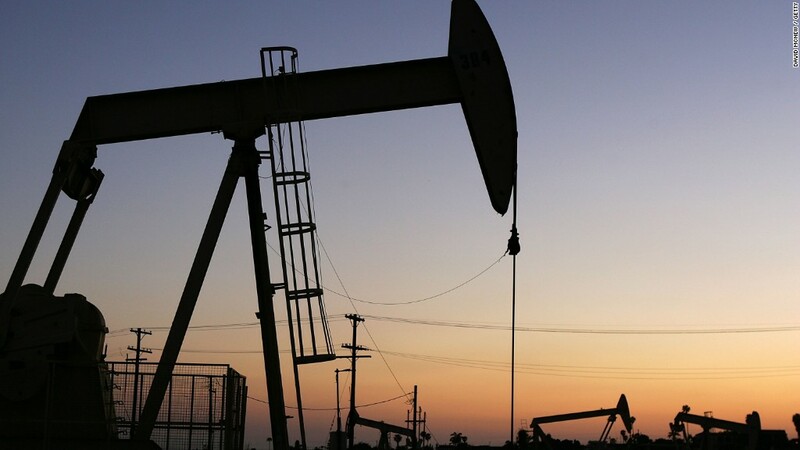 Oil briefly spiked above $38 a barrel on Monday but it retreated back below $36 by Tuesday. The lack of reaction in the global oil market is even more remarkable given that Saudi Arabia and Iran are not just sitting on more than 400 billion barrels of oil, but they are located uncomfortably close to the Strait of Hormuz. That narrow shipping channel is the world's most important oil chokepoint, with 17 million barrels flowing through each day, according to the Energy Information Administration. "You cannot afford to disrupt oil supply from this part of the world -- for any period of time," said Fidel Gheit, Oppenheimer's senior oil and gas analyst. So why aren't oil traders worried silly about this confrontation? Because few believe a shooting war between Saudi Arabia and Iran will actually start. And the bigger reason: the "geopolitical risk premium" that used to be baked into oil prices is long gone. It's been removed by the epic supply glut set in motion by the U.S. shale oil boom and OPEC's refusal to cut oil production, which have caused oil prices to crash since mid-2014. "Prices would have gone nuts if it wasn't for the oversupply problem, which has acted as a safety blanket for the market," said Matthew Smith, director of commodity research at ClipperData. In fact, some observers think the recent spat between Saudi Arabia and Iran only lowers the already-remote chances that OPEC members agree to slash production. If anything, the war of words shows how dysfunctional OPEC really is. 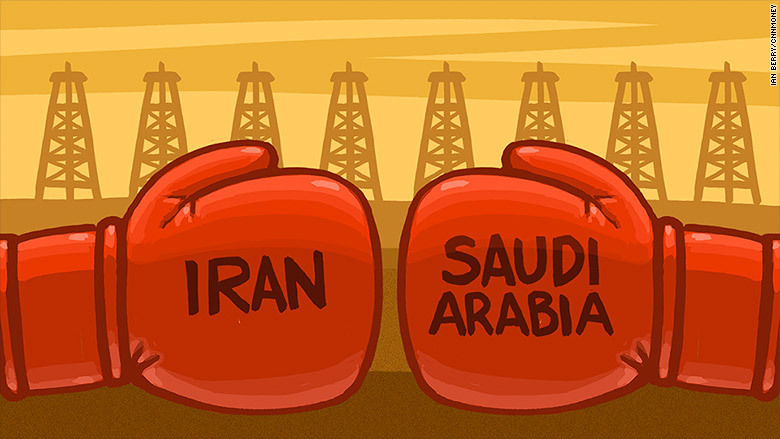 "Saudi Arabia and Iran are less likely to cooperate with the other to support prices. Consequently, oil prices may plummet even lower," said Giorgio Cafiero, CEO of Gulf State Analytics, a geopolitical risk consultancy. Saudi Arabia is also seen as less inclined to help boost oil prices at a time when Iran prepares to export more oil as part of its historic nuclear deal. The "historic low" reached in the relations between the two OPEC powers are actually likely to lead Saudi Arabia to "dig in its heels to keep output at or even above current levels," Barclays wrote in a research report. That would only deepen the crash in oil prices. Of course, that would be great news for American drivers, who continue to save big on cheap gas prices. That's not to say that the developments in the Middle East aren't concerning. Tensions clearly remain elevated following Saudi Arabia's execution last weekend of a prominent Shiite cleric and the subsequent torching of the Saudi embassy in Iran. Saudi Arabia has since cut off diplomatic ties and flights to Iran. Kuwait, the United Arab Emirates, Bahrain and Sudan also made their displeasure with Iran clear. Brace for a dramatic response should there be a significant escalation of this conflict that threatens to interrupt the flow of oil. "Any disruptions in production would have huge implications," said Rob Thummel, a portfolio manager at energy investment manager Tortoise Capital. While unlikely, an all-out war between Saudi Arabia and Iran would almost surely unleash a violent surge in crude oil prices. "I could see oil prices going to $200 a barrel if you have a shooting war. The traders would have a field day," said Oppenheimer's Gheit.